The Islamic New Year has already begun. Around the globe, Shiites are observing ceremonies to commemorate the martyrdom of the prophet’s grandson Hussein in the battle of Karbala. These ceremonies are central to Shiite identity globally. The rich variety of these traditions worldwide provides a window into the diversity of Islamic religious expression. Muharram Procession through the Old City of Hyderabad, India. Mourners by their thousands lament the death of Hussein at the Battle of Karbala. Photograph by Paul Mason copyright 2012. Last year, I travelled to Hyderabad, India, to observe local ceremonies during Muharram, the first month of the Islamic lunar calendar. I had previously documented Muharram ceremonies in Indonesia in 2009 and I was inspired to see what present-day Muharram ceremonies looked like in India. The ceremonies in Indonesia originated in India. Sepoy Indians under the command of the British in the nineteenth century transported the ceremonies throughout Southeast Asia. The ceremonies proved popular throughout the Indo-Malayan archipelago, but believing that the ceremonies had connections to Mohammadean secret societies and Chinese Triads, British colonial powers sought to extinguish the event. Muharram public rituals survived only in two locations, Pariaman and Bengkulu along the Western coast of Sumatra, but only because Sumatra was handed over to the Dutch in 1824. In other locations Muharram ceremonies might have continued but they changed to become unrecognisable from their Indian origins. In Pariaman and Bengkulu, Sunnis and Shiite Indian descendants have continued contemporary interpretations of Muharram ceremonies that have come to include diverse performing arts and symbolic processions. The Islamic lunar calendar is shorter than the Gregorian calendar and it was around this time in November last year that I arrived in Hyderabad, India, for the month of Muharram. I arrived in Hyderabad the day after mob violence near Charminar, an iconic landmark in the middle of the Old City of Hyderabad. Police barricades and fences had been set up around Charminar and vehicles were stopped from approaching the building. Reading newspaper articles and watching television reports made me feel tense about being in this foreign location. Schools and colleges had lower attendance rates due to the commotion, but on the whole little tension was evident among the people of Hyderabad. Numerous people I interviewed asserted that Muharram is a sacred month for all Hyderabadis not just Muslims. Although Shiite minorities originally stimulated Muharram ceremonies throughout India, today the ceremonies involve Sunnis and Hindus as well (Cole 1988: 115-117; Pinault 1993: 160). The disturbance at Charminar came at the end of five testing months for city policemen and while they remained on high alert, the city was thankfully a pleasant place to stay for the duration of my fieldwork. With only a month to spend in India, fieldwork was an intense period of data collection. I began interviews the moment I landed in Hyderabad city. I was fortunate to have been put in contact with several locals and despite a busy schedule, I also managed to visit the Golconda fort, Ramoji Film City, and even the 18 meter high statue of Gautama Buddha in the middle of Lake Hussain Sagar. The most important cultural visits, however, were to the Ashurkhanas that are spread across the whole city of Hyderabad. The Ashurkhanas are places of mourning erected in veneration of Hazrath Imam Hussein and his 72 companions who were martyred in the battle at Karbala in Iraq centuries ago. Inside each Ashurkhana are placed sacred objects that represent the Battle standards used by Hussein and his companions. Many Shiite families will have a special room for their own Alams, as well as make trips to visit the Alams in the various Ashurkhanas throughout Hyderabad. The Ashurkhanas are not only important locations for Shiite Muslims, however, they are also important sites of cultural heritage for all the people of Hyderabad. The Ashurkhanas were a creation of the Qutub Shehi from Persia who once ruled over Hyderabad for nine generations in the 16th and 17th century. Shiites are not the only people to be custodians of the Ashurkhanas, some Ashurkhanas are looked after by lineages of Hindu families who have passed down caretaker responsibilities from father to son for several generations. 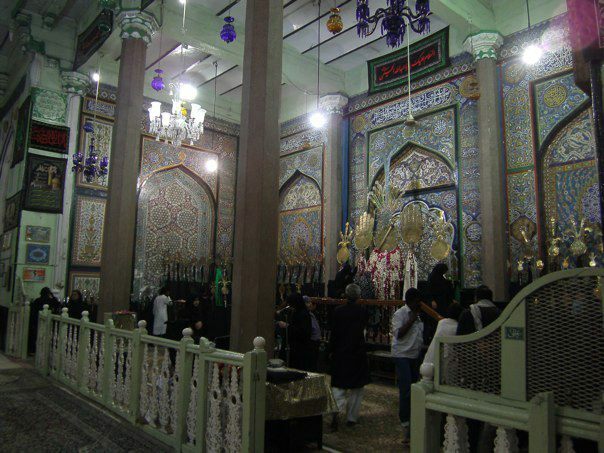 The Badshahi Ashurkhana: Decorated with coloured tiles, this house of mourning is frequented by pilgrims who mourn the martyrdom of prophet’s Grandson. Photo by Paul Mason copyright 2012. What I quickly learned about Muharram in Hyderabad was that studying the public rituals was strongly connected to studying the histories of the city, not just the cultural heritage of Shiite communities. I say “histories” in the plural, because so many people involved in the Muharram ceremonies recount various parts of the history of Muharram, which is strongly connected to Hyderabad’s Shiite past. Shiite families also told stories about their Alam heirlooms, stories which were strongly connected to their own family lineages. The Alams are made of metal and are symbolic of the Karbala flagbearers with names often inscribed upon them. These objects and their histories make the story of Karbala more intimate and personal. The ceremonies and observances during Muharram offer an opportunity to reinforce personal connections with the past, cultural representation among the Shiites, and the legacy of Shiite history in Hyderabad city. Muharram commences with ten days of Shiite ceremonies. Perhaps the most well-known of four sacred months in the Shiite calendar, Muharram public rituals are famous because of breast-beating, weeping, wailing, self-flagellation and sometimes even self-mortification with razors, flails and knives (see Chelkowski 1979: 2-3; Hasnain and Husain 1988: 145; Pinault 1992: 135, 180). In parts of the Middle East, Muharram-related events can be a source of conflict between Sunni and Shiite Muslims (Fazel 1988: 49) with some processions becoming violent (Halm 2007). Sunni Muslims observe the death of Hussein but do not condone acts of self-mortification exhibited by some Shiite groups (Korom 2003:62, 75). In various parts of the world, Muharram events have been interruptive to social hierarchies (Mishra 2008: 81) and catalysts for political dissension (Fazel 1988: 50). Sadly, Muharram ceremonies last year in Dera Ismail Khan in Pakistan were sabotaged by terrorism. 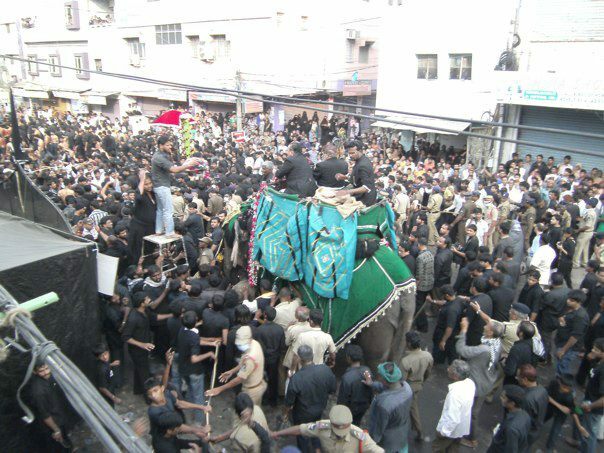 When they are not disrupted, Muharram ceremonies have significant bearing upon religious, political and social spheres of human activity (Asad 2003; Fibiger 2010). For Shiite men and women, the stories of Muharram are a source of role models and a lens through which they interpret their present-day social situations (Deeb 2006; Fibiger 2010). 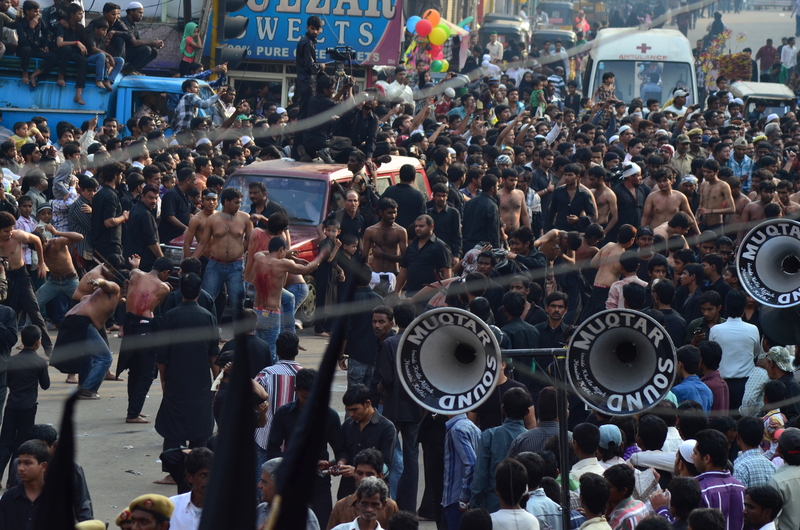 Muharram ceremonies shape personal experience and dramatically impact upon social and political worlds. Outside Iran, Iraq, Bahrain and Azerbaijan, Shiite communities are generally a minority. Being a minority adds to the emotional experience of remembering the loss to a larger enemy force at the Battle of Karbala. With the persecution and displacement of so many Shiite communities worldwide, we might like to stop and enquire how Muharram ceremonies are being observed in refugee camps across the world. Over the first ten days of Muharram, Shiites will meet up to recount the tragedy of Karbala. Men’s groups and women’s groups will congregate at private residences, mosques and Ashurkhanas to pay their respect to Alams, listen to Marsiya elegies, pay attention to Bayan sermons and Noha poetry, and engage in Matam mourning. These events are called Majlis and are held all throughout the day. Devotees might attend several Majlis events in a day with increasing frequency before the tenth day of Muharram. I found people to be very welcoming and consider myself privileged to have been invited to attend several Majlis to listen to the Marsiya and take part in the Matam. Men and women will often hold majlis separately. If men and women participate in the same Majlis, a curtain will separate them. 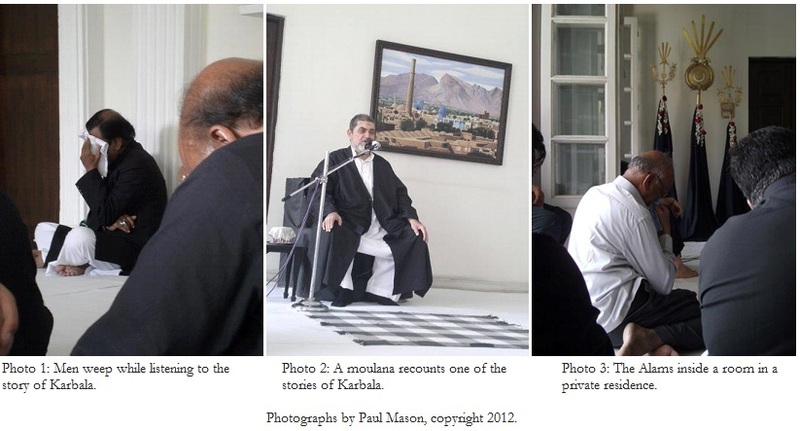 These events involved ritualised narrations and chants of the Karbala story that increased in speed over time. Over the course of a Majlis call and response chanting would increase in tempo until people were eventually swept up in emotion, beating their chest with their open palms and weeping with the overwhelming sadness of Hussain’s martyrdom. My description does little justice to the emotional experience. The orators are religious leaders, called Moulana, and well-respected scholars who have expertise in recounting the stories of Karbala. With supplicant hand gestures, emotional prosodic tones, and sorrowful facial expressions, an expert orator can lead an audience skilfully through the painful story of Hussain’s stand for justice. Cries of “Hussain” will rhythmically echo throughout a Majlis group and audible sobs will wash across the room. The Majlis rituals have their own history that is reverently observed with bowed heads and earnest hearts. Although Muharram ceremonies continue for more than just the first ten days of the Islamic New Year, the tenth day, the day of Ashura, is the most deeply rousing. Majlis rituals are conducted with increasing frequency before the day of Ashura and the rituals are conducted under increasingly trance-inspiring conditions. In jam-packed rooms with fans turned off during the daytime and lights turned off during the night-time, men will gather to participate in recitations, chanting and rhythmic breast beating. The events are simultaneously very moving but also quite casual. Between bouts of weeping and wailing, boys and men will chat with each other about ordinary matters and even joke with each other in a lighthearted fashion. Predominantly younger men engage in the most energetic Matam displays with older men testifying to their own years of selfless mourning. The groups exhibit a strong sense of community building. These groups also facilitate the displays of piety which culminate in processions of self-flagellation and self-mortification in the afternoon of Ashura. Between the ninth and tenth day of Muharram, I accompanied a young devotee as he travelled by motorcycle around the various Ashurkhanas, Mosques and private residences where he paid respect to Alams, listened to speeches, and participated in Majlis. Barefoot and dressed in black, it was a pilgrimage of sorts. At the various events and locations, we were frequently offered food including Tabarok, a milk and almond sherbert, and Biryani, the local rice specialty. All through the night, the streets of the Old City were well lit. People were cooking food, preparing drinks, and playing chants loudly through makeshift speaker systems. Some devotees will not eat during the night in respect of Imam Hussain. The lack of nourishment adds to the immersive experience of the chanting and breast-beating. In the lead up to the final procession on the afternoon of Ashura, the lack of sleep and the act of participating in numerous Majlis from dusk till dawn is quite an intense experience. There are numerous processions around Hyderabad but the biggest is called the Bibi Ka Alam procession and starts its journey in Dabirpura and continues toward Chaderghat. The Bibi Ka Alam procession is huge with hundreds and hundreds of men being led through the street by a famous Ashurkhana custodian, Aliuddin Arif, who guides an elephant and collects donations and garlands and also distributes gifts of coconut and blessings. Accompanying the elephant were four Mahouts and a medical team. The parade used to involve two elephants, but one of the elephants has passed away and law only allows the procession to include the remaining elephant for the remainder of its life. Women and children also participate in self-flagellation and self-mortification but generally in more private spaces. A ritual cut of the forehead is not uncommon. Prior to the procession the streets are sprayed with water to cool them down, but also to help stop the spilt blood from congealing on the street. After the procession, the metallic smell of blood can make observers feel quite faint. The procession takes about an hour to pass any particular point with groups of men walking past and stopping for brief bouts of body cutting. Some will hold razors between their fingers as they beat their bare chest, others will swing flails or even hold swords over their head to cut their back. More than once I had to kneel down and look away to stop myself from fainting. To stop people from becoming too swept up in the rituals, other participants will spray rose water on the devotees to cool them down. The rose water stings and stops the most energetic Matam participants from hurting themselves too badly. The procession is also closely surveyed by police and medical staff. More than a few times during the procession, Matam participants were grabbed by their friends and taken to a medical van for first aid treatment and basic rehydration. The number of incidents, however, was surprisingly low given the large number of people engaging in this ceremony. After the procession finished, shops and restaurants opened their doors once more and life in Hyderabad began again as usual. In cities such as Hyderabad and Lucknow in India, Muharram ceremonies involve Shiites, Sunnis and Hindus and also embrace the involvement of people from other religions including Christians. Everyone is welcome to join in the mourning. While these ceremonies display substantial hybridity, they have also become significant sites of religious identity, ethnic representation, and community building for local Shiites (Pinault 1992). In an edited volume called Human Rights, Culture and Context, Talal Asad describes the self-flagellation rituals of Muharram in a discussion about how conceptions of cruelty, pain and torture change across cultural contexts (1997: 111-133). The argument is familiar to anthropologists. Asad calls for more attention to analysing the thought and behaviour of another culture on its own terms. Reading Asad’s chapter inspired me to think about the rituals of pain in my own culture. In Australia, men and women will go to the gym to rip muscle tissue on various equipment in order to build more toned and attractive physiques, they will subject themselves to potentially harmful surgical techniques, and even undertake arduous cosmetic treatments with the painful practice of waxing being a well-known example. While rituals of pain during Muharram are in worship of religious values and ideals, so many rituals of pain in my own culture are in worship of aesthetic desires. I risk depicting a dichotomy based on a functionalist perspective, but the contrast between self-flagellation in remembrance of martyrdom and body reshaping in pursuit of beauty does invite deeper reflection on rituals of pain. Photograph by Som Banerjee copyright 2012. Shiite religious practices in India are well documented (e.g. Cole 1988; De Tassy 1995; Hasnain & Husein 1988; Pinault 1997). However, the first and only English article about Muharram ceremonies in Indonesia was published 27 years ago (Kartomi, 1986). The ceremonies have changed significantly since Kartomi’s introductory research on the event in the 1980s. A paucity of historical and ethnographic research exists about the Muharram ceremonies outside of Iran and India, with a written ethnography about a form of these ceremonies in Trinidad published in a book by Korom (2003) and the history of these ceremonies in Surinam published as an article by De Boer (2001). Margaret Kartomi recently revisited her work on Muharram ceremonies in Sumatra in her book, Musical Journeys in Sumatra. From Persia to the furthest satellites of the Muslim world, Muharram ceremonies are diverse, rich and varied. In the city of Hyderabad, for example, Muharram ceremonies involve vocal chants and rhythmic body percussion. Along the Western coast of Sumatra, on the other hand, Muharram ceremonies are accompanied by a plethora of musical and dance performances. From public rituals of self-flagellation in India to symbolic processions in Sumatra, the diversity of religious expression in mourning the martyrdom of the Prophet’s grandson Hussein annually every Muharram is testament to the fact that no religion is monolithic. “Islam—resignation to the will of Allah—denotes the religion taught by Muhammed, the Prophet” (Hasnain and Husain 1988:137). The followers of Islam are divided into two main sects, the Sunnis (those of the Path, traditionalists), and the Shiites (followers of Ali) (1988: 137). After the Prophet died in 632 AD traditionalists (who came to be known as the Sunni) succeeded in electing three consecutive religious leaders; Abu Bakr, Umar and Usman (Hasnain and Husain 1988: 137-138). For Shiites, however, it was Ali bin Abitalib, the cousin of the Prophet and husband of his only daughter, Fatima, who they maintain was the first legitimate Imam explicitly nominated by the Prophet (Hasnain and Husain 1988: 137; Thaiss 1994:39; Suharti 2006:iv). Accordingly, the Shiites reject the first three religious leaders recognized by the Sunnis (Hasnain and Husain 1988: 137-138). Ali only became official leader of the Muslims more than two decades following the death of the Prophet and was assassinated after only five years of rule (Thaiss 1994: 39-40). Ali’s eldest son, Hasan, temporarily succeeded him but almost immediately abdicated his position to the governor of Syria, Mu’awiya, who had earlier challenged Ali’s right to govern (Thaiss 1994:40; Nakash 1994:141). Mu’awiya possibly made a false promise to revert the leadership back to Hasan after his death (Nakash 1994: 141). However, Hasan never assumed this position again as he was poisoned eight years later by his wife at the rumoured instigation of Mu’awiya (Ibid.). Scholars of Islam contend that “The tragedy of Karbala played the greatest role in the growth of Shiaism” (Hasnain and Husain 1988:143), that “no other single event in Islamic history has played so central a role in shaping Shiite identity as the martyrdom of Husayn and his companions at Karbala” (Nakash 1994:142) and that “the popular Shi’ite Islam annual Muharram pageantry helped greatly in spreading Shi’ite doctrine across the Iranian plateau” (Chelkowski 1979:256). Quite soon after the death of the grandchild of the Prophet Muhammad, Imam Hussein, Karbala became a place of pilgrimage and veneration (Chelkowski 1979:2; Thaiss 1994: 40). Ashura, the tenth day of the month of Muharram, became an anniversary of voluntary self-sacrifice among Shiites known as Ta’ziyeh in Iran, Muharram in India, Hosay in Trinidad (Korom 2003:1), Tajiyah in Surinam (de Boer 2001), Tabot in Bengkulu, Southwestern Sumatra (Widiastuti 2003) and Tabuik in Pariaman, West Sumatra (Suharti 2006). All Muslims observe the death of Hussein (Korom 2003: 62). The eighth Shiite imam, Alî ar-Ridâ (Halm 2007: 26), provided strict guidelines to observe Ashura with grief and weeping, which would be rewarded with “a blissful eternity in paradise” (Korom 2003: 57). Those who did not follow these guidelines would join Yazid in the “deepest pit of fire” (Ayoub 1978:151). The Sunnis commemorate Ashura as a distinct tragedy in the history of Islam, but they do not condone acts of self-mortification exhibited by some Shiite groups (Korom 2003:75). In Bombay, Muharram-related events have been catalysts for political dissension (Fazel 1988: 50) and sites of conflict between Sunni and Shiite Muslims (Fazel 1988:49) but the processions have allegedly only become violent when Shiites feel provoked by disrupters (Halm 2007:81). From Persia to the furthest satellites of the Islamic world, the Ashura observances have spread and “assumed many forms, reflecting the diverse cultures and ethnic groups among which they developed” (Nakash 1994:142). In Iran, annual mourning processional ceremonies were well established by the tenth century AD and have been performed with great pageantry and emotion ever since (Chelkowski 1979:2-3). In India, celebrations of Ashura were stimulated by a minority sect of Shi’ite Muslims and today involve Sunnis and Hindus (Campbell 1988; Cole 1988:115-117). Hindus will often visit Shiite shrines and offer homage to Hussein during the month of Muharram (Pinault 1993:160). From India, Ashura has spread further and become a popular pan-Indian festival in places where Indians went as indentured workers and where Shiites were a minority (Wood 1968:151). In Surinam, for example, the festivities were practiced regularly until the 2nd World War after which time the number of Shiite practitioners fell and the tradition lost popularity, being last seen in 1987 (de Boer 2001). In Trinidad, the festivities became part of the carnival period festivities and assumed the name Hosay, supposedly as a derivation of the name, Hussein (Korom 2003). Tabuik in West Sumatra has formed in a distant outpost of the Shiite world (Kartomi 1986:144) where a predominantly Sunni community continues a unique expression of the Muharram observances. Present day Muharram ceremonies date back to at least as far as the tenth century Shiites in Iran (Kartomi 1986:144). The mourning processions were later developed in Persia after 1500 AD, and then through Persian contact with India became a recent unique Indo-Muslim culture that cannot claim great age (Ibid.). The earliest roots can be traced even further back to pre-Islamic Persian legends. Muharram ceremonies found ready ground in the ritual plays of Sasanian and Parthian tragedies of ancient Persia (Yarshater 1979:89) and the origin and development of the indigenous ritual drama of Hussein can be drawn from Mesopotamian, Anatolian and Egyptian myths (1979:94). Pre-Islamic Persian legends with themes of redemptive sacrifice that venerate deceased heroes, find continuation in Hussein’s story (Chelkowski 1979:2-3). Supporters believe that Hussein’s suffering and obedience to the will of God gave him the exclusive privilege of making intercession for believers to enter Paradise (Thaiss 1994:40). Images from the procession courtesy of Som Banerjee. I am indebted to a large number of people who so generously shared their time to teach me about the Muharram ceremonies, to put me in contact with knowledgeable locals, and to have helped me navigate this incredible event in Hyderabad. I have not named these kind people here for privacy issues and any mistake in the representation of events is of course mine. Asad, Talal. (1997) On Torture, or Cruel, Inhuman and Degrading Treatment. In Human Rights, Culture and Context. Wilson, Richard, London: Pluto Press, pp. 111-133. Asad, Talal. (2003) Formations of the Secular: Christianity, Islam, Modernity. Stanford, CA: Stanford University Press. Campbell, S. (1988) Carnival, Calypso, and Class Struggle in Nineteenth Century Trinidad. History Workshop, 26, 1-27. Chelkowski, P. J. (1979) Ta’ziyeh: Ritual and Drama in Iran. New York University Press. Cole, J. (1988) Roots of North Indian Shi’ism in Iran and Iraq: Religion and State in Avadh. University of California Press, Berkeley, 1722-1859. De Boer, W. (2001) Tajiya, een verloren islamitisch rouwfestival, Oso: tijdschrift voor Surinaamse taalkunde, Letterkunde en geschiedenis, 20(2), 287-294. De Tassy, Garcin (1995) Muslim Festivals in India and Other Essays, Delhi: Oxford University Press. Deeb, Lara (2006) An Enchanted Modern: Gender and Public Piety in Shi‘i Lebanon. Princeton, NJ: Princeton University Press. Fazel, M.K. (1988) The Politics of Passions: Growing up Shia, Iranian Studies, 21(3/4), pp. 37-51. Fibiger, T. (2010) Ashura in Bahrain: Analyses of an Analytical Event, Social Analysis, 54(3), 29–46. Halm, H. (2007) The Shiites: A Short History. Markus Wiener Publishers. Hasnain, N., Husain, S.A. (1988) Shias and Shia Islam in India. Harnam Publications, New Delhi. Jafri, S.H.M. (1979) Origins and Early Development of Shiá Islam. Longman. Kartomi, M. (1986) Tabut – a Shi’a Ritual Transplanted from India to Sumatra, In David P. Chandler and M.C. Ricklefs (eds) Nineteenth and Twentieth Century Indonesia; Essays in Honour of Professor J.D. Legge. Melbourne: Centre of Southeast Asian Studies, Monash University, 141-162. Korom, F.J. (2003) Hosay Trinidad: Muharram Performances in an Indo-Carribean Diaspora. University of Pennsylvania Press. Mishra, S. (2008) ‘Tazia Fiji! The Place of Potentiality,’ in S. Koshy and R. Radhakrishnan (Eds.) Transnational South Asians: The Making of a Neo-Diaspora. Oxford: Oxford University Press. Nakash, Y. (1994) The Shi’is of Iraq. Princeton University Press. Pinault, D. (1992) The Shiites: Ritual and Popular Piety in a Muslim Community. I.B. Tauris & Co.
Pinault, D. (1993) The Shiites. Palgrave Macmillan. Pinault, David (1997) Shi’ism in South Asia, The Muslim World, 87, 235-257. Suharti (2006) Tabuik: Ritual Kefanatikan “Kaum SyiaÁh”Di Pantai Barat Sumatera Barat, Laporan Penelitian: Sekolah Tinggi Seni Indonesia Padang Panjang. Thaiss, G. (1994) Contested Meanings and the Politics of Authenticity: The Hosay in Trinidad, In Akbar S. Ahmed, H. Donnan (eds) Islam, Globalization and Postmodernity. Routledge, pp. 38-62. Widiastuti, W. (2003) Analisis Jaringan Komunikasi Dalam Mempertahankan Kepercayaan Terhadap Mitos Seputar Tabot Pada Kerukunan Keluarga Tabot Kota Bengkulu. Laporan Penelitian, Universitas Bengkulu. Wood, D. (1968) Trinidad in Transition: the Years after Slavery. London: Oxford University Press. Yarshater, E. (1979) Ta’ziyeh & Preislamic Mourning Rites in Iran, in Peter Chelkowski (ed) Taziyeh, Ta’ziyeh: Ritual and drama in Iran. New York University Press. pp.88-94.